Fri, 28 Jul 2017 at 11:44 p.m.
Get in behind, readers. Have yourselves a draught of Bells, and let me untangle the web that starts with the inexplicable antics of Ms Turei. Any sentient citizen must be, by now, aware that Ms Turei attempted to make political capital out of her long term benefit fraud last week to assist in marketing the Green Party’s new welfare policy. Sadly for Ms Turei, a thing called the internet means that her previous fictions about the circumstances around her early solo parent years are all easily discoverable, and the Whale Oil blog has done a telling summary of Ms Turei’s various mendacities. (Thanks Cameron). Overwhelmingly, the Kiwiblog and other commentariat have excoriated Ms Turei’s inexplicable move, but again, Whale Oil offered the most penetrating analysis (and no, I am not a Whale Oil subscriber, or have ever been in contact with Cameron Slater…). 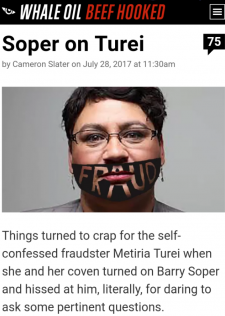 Mr Slater made the interesting points, repeated by Barry Soper and others, that not only was Ms Turei guilty of benefit fraud, but also received a study grant as well. Ms Turei refused to name the father of her baby to WINZ, who has now been subsequently revealed as Paul Hartley, son of Ann Hartley, former Mayor of North Shore. Consequently, no child support has ever been received from Mr Hartley. Ms Turei confirmed that “Grandma” (Ms Hartley) provided support – very likely including financial support, which undoubtedly has not been declared. One of the unfortunate unintended effects of the whole affair is that this will be red meat to many right wing types of a particular gender and particular demographic to start a predictable chorus of “Welfare Queens” abusing the system. Middle aged guys, this was old (and not true) even when Ronald Reagan used it to get elected in 1980. As noted in the comments below, the amount of white collar fraud that goes unprosecuted is about 30 times the estimated amount of benefit fraud, so to the white collar industries of accounting and law that seek to advise on the fine line between tax “minimisation” and tax “avoidance” : let those without sin cast the first stone. While all this is very interesting and will lead to the certain demise of Metiria Turei after the election, if not before as the Green’s poll numbers continue to stagnate or decline, the commentariat has missed the bigger issue which is “What Did The Law Society Know and What Did They Do About It ?”. Ms Turei initially declined to say if the fraud was disclosed to the Law Society in her 1999 interview to determine if she was “a fit and proper person” to be admitted to the bar, but then decided immediately afterward that refusing to comment would put her on a par with Jonathan Coleman and Todd McLay, so confirmed on July 26 that she had been “upfront” to the Law Society, and there had been a “long conversation” about it. What is fascinating about this, and an extreme concern for anyone who has had to rely on or transact with lawyers, is that the Law Society, the body tasked with determining who is a fit and proper person to become a lawyer – to uphold the law – then on Ms Turei’s version of events confirmed to Ms Turei that this dishonesty did not matter. Readers, I too spilt Bells all over the sofa when I read that the Law Society had known about this for nearly 20 years and been complicit in Ms Turei’s dishonesty. How could it be that the profession dedicated to upholding the law could decide that some didn’t apply to them ? Following on from this if the Law Society did not think it was relevant or significant that a prospective lawyer had engaged in several years’ worth of benefit fraud, then what is the situation regarding her first employer, Simpson Grierson (one of the largest law firms in the country). Either they were lied to about the fraud, or they also had a relaxed attitude towards employing law graduates indulging in benefit fraud. As we have often remarked in the Delta Epic Fraud series, truth is indeed stranger than fiction, and the facts of the matter are that the Law Society have previously allowed struck-off lawyers with convictions resulting from dishonesty to be reinstated to the bar. One such lawyer is one Chris Gilbert, upon whom the fortunes of the Christchurch City Council (and indirectly, the DCC), rest in terms of the liability for the Yaldhurst Noble subdivision debacle, in the latest litigation. In reinstating Mr Gilbert to the bar, the Law Society ignored the opposition of three lawyers and two branches of the Law Society, including the Otago branch, who said the gravity of the offending made him unsuitable for reinstatement. Mr Gilbert “misappropriated” $44,000 of client funds in 1987 and 1988. Compounding this, a few years later, Mr Gilbert appeared to think that the Society’s rules were all overrated anyway and proceeded to sign legal documents on the fiction that he was still in fact a lawyer ! Brandishing a wet bus ticket, the Law Society warned Mr Gilbert “there would be no third chances !”. Readers, two hands on the cup : The Christchurch City Council actually said that Mr Gilbert “was the best candidate for the job”. This was rather against the advice of the Waikato Law Society, where Mr Gilbert committed his first fraud: they said in an affidavit Mr Gilbert was not a “fit and proper person” to be a lawyer. Now place the cup down – you won’t cope with this : The Law Society gave Mr Gilbert his “third chance” on the basis that he could only work for the CCC. In other words, he wasn’t allowed to act for private individuals who had the choice to take or leave his services and make complaints if warranted. Instead he could be responsible for issues involving huge amounts of ratepayer funds, because the Law Society appeared to think that position required a much lower standard of integrity. Readers, why would the Christchurch City Council employ Mr Gilbert ? Readers, feel free to draw your own conclusions. The most incredible fact of this rather incredible tale is that Mr Gilbert was no short-term stopgap to tide the CCC over a tight staffing spot. Mr Gilbert has been the team leader of legal services at CCC for 13 years. He seems to be part of the institutional furniture, and appears to be indispensable. Your correspondent is advised that in relation to the Noble Yaldhurst litigation, Mr Gilbert is not surprising the plaintiffs with bursts of even-handedness. This perhaps is one reason why the pace of the Christchurch rebuild is glacial – Minister Brownlee and the Government would be fully justified in having serious reservations about the competence of the Christchurch City Council, and not just in the building control division. Readers, tonight’s conclusion is surprising – we as Dunedin ratepayers can look with relief at Mr Gilbert and know that within the DCC itself (although NOT Delta and Aurora) this would never occur under the present management. Disclaimer: The site owner is not responsible for the currency or accuracy of content of contributed comments; and the inclusion of the information provided does not imply endorsement by the site owner.